A beautiful shaped 14ct Strawberry Gold wedding band from luxury jewellers Le Vian. Embellished with 0.14cts of radiant Chocolate Diamonds. Matching Engagement Ring: 8222940. 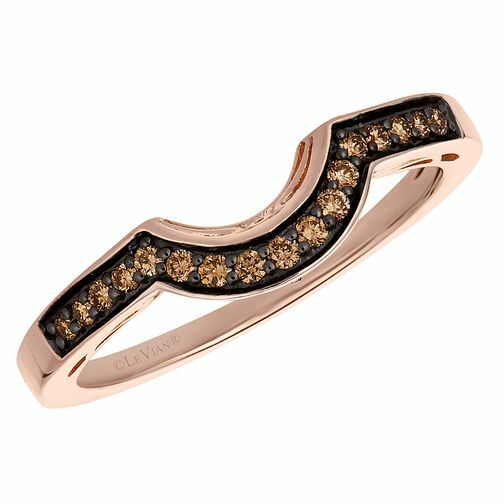 Le Vian 14ct Strawberry Gold 0.14ct Chocolate Diamond Ring is rated 5.0 out of 5 by 2. Rated 5 out of 5 by Anonymous from Great looking ring This ring fits with the engagement ring from the same company and together looks outstanding. Rated 5 out of 5 by Anonymous from This product is so beautifully unique As someone who loves things that are bit different, quirky and beautiful, this ring was the perfect choice for me as it matches my Le Vian engagement ring perfectly. I was worried it would overshadow my engagement ring but it has been designed to complement it and fit exactly without taking away the attraction of the other ring. I love the unique shade of strawberry gold and can’t wait to wear it forever!